As the holiday season approaches we’re all looking for quality toys for our children. Readers of this blog, and increasingly the world at large are seeking toys that are eco friendly and inexpensive too. That’s why Eco Childs Play agreed to team up with Goddard Systems, Inc, one of the largest child care providers in the country, to seek out the best green toys we could find for under $30.00. We’re happy to announce the 10 finalists today! Mama K`s Aromatic Play Clay is 100 % natural, bio-degradable, gluten free play clay. It combines aromatherapy with activity and fun. With seven scents to choose from including soothing lavender, relaxing chamomile and tension-easing bergamot, fun never smelled so good! Mama K`s Play Clay is also suitable for kids with Celiac and Autism Spectrum disorders. Learning to count is fun with this Octopus Number puzzle. Hand-crafted & hand painted with child-safe paints. Count Octopus is made from plantation-grown rubberwood, an environmentally-friendly hardwood. Now little ones can learn all about the basics of recycling. Made in the USA from 100% recycled milk containers, the Green Toys Recycling Truck sorts bottles, cans and paper. It also has a movable recycling bed and open/shut rear door. It is safe, non-toxic, BPA-Free and packaged in recycled and recyclable materials. Pull up a chair; it`s time to serve up some eco-friendly imagination! The 17-piece Green Toys Tea Set includes a tea pot with lid, a sugar bowl with lid, a creamer, four cups, four saucers and four teaspoons. It is made from curbside collected milk containers and also meets FDA specs for food contact. A soft, educational toy, Hugg-A-Planet helps children learn about caring for planet Earth. It features over 600 places labeled, showing oceans, continents, islands and more. Organically adorable, the Joobles Collection features a variety of eco-friendly, fair trade characters. Made out of 100% organic cotton, these soft and squishy characters are hand knit! Children of cooperative workers are helped by the Fair Indigo Foundation, which provides educational programs and supplies. Ring a Thing transitions children from free play to first games with rules. It`s also a fun way for children to recognize colors and sizes. For 1-3 players, Ring a Thing is made of beech wood. HABA products have passed certification that guarantees a high quality environmental management system. Help kids learn about healthy eating with the Veggie Cutting Set from ImagiPLAY. This vegetable set helps children develop motor skills and coordination while encouraging them to learn about healthy food in a fun role play environment. Segmented and secured with Velcro, for cutting over and over again, segments can be combined to create entirely new vegetables! This 16-piece activity toy is made from all-natural, earth friendly rubberwood. Bring the outdoors in with this beautiful set of rustic tree branch blocks. Perfect for stacking and building, each set comes with many unique pieces, various diameters and lengths for the ultimate in creative building. Tree Branch Blocks are made with kiln dried, locally (Vancouver Island) sourced Alder with Harmonic unbleached beeswax finish. 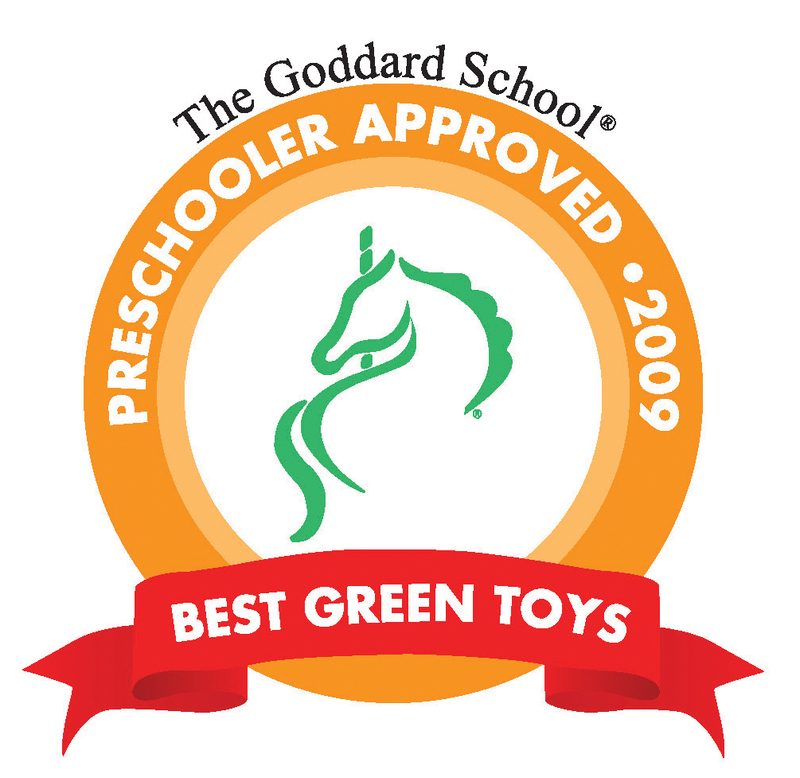 In addition to Goddard`s national list of Top 10 Eco-Friendly Toys, preschoolers at participating Goddard Schools across the country will have the opportunity to play with the top ten toys and pick their favorites. Schools will then announce their “Local Preschoolers Picks” for the Eco-Friendly Toys of 2009. Participating Goddard Schools will also hold community toy drives with Toys forTots, or a local charity of the school’s choice. You can find all of the great entries into our contest- over 50 eco friendly toys on our Facebook page and comment on your favorites! Photos can also be found on our Flickr Stream. Please Tweet out your favorites using the hashtag #bestgreentoys. This is a great help. Thanks goes out to Eco Child`s Play and Goddard for taking the time and doing the research to help me find the perfect gifts for my kids. Thanks for the post. Awesome! Yay for MamaK’s Clay! This is a really fantastic list of green toys. Thanks for writing the article. you can Find Imagiplay and Green Toys products at Nubius Organics and I wanted to share a 15% off coupon code: ECO15 to this sites readers to help you save for the holidays. I don’t really believe that eco friendly toys will help our world.